One of the most wonderful things of Oracle Open World are the Demo-Grounds. When you want to learn more about a certain feature, this is the place to go to. The actual developers and product managers are there to answer your questions and more! In a previous blog I had written about Temporal Validity in Oracle 12c and whether it would be possible to have multiple validity periods on one table. You can read that blog by following this link. As you can read in that blog it is possible to create multiple Validity Periods on one table, but only via an ALTER TABLE statement. That kept me wondering whether what I was doing was supported and what would be the proper way to go and create multiple Validity Periods for a single table. 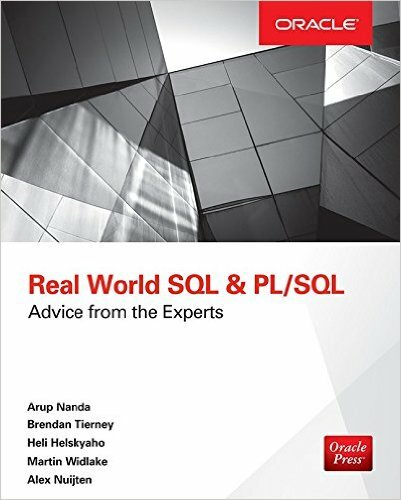 Because I was still at Oracle Open World when I wrote that blog, it was easy for me to go over to the Demo-Grounds and get my answers.. However this was not as easy as it sounds. After having finally found the correct station the gentleman I spoke to couldn't give me a satisfying answer, which made me doubt if I had indeed found the correct station. Maybe I didn't find the correct station, or maybe it was the language barriere that I couldn't explain what I wanted to know. Or maybe he just didn't know the answer... anyway, he was very kind and showed me some other things. By chance I ran into Bryn Llewellyn, Distinguished Product Manager for PL/SQL, and talked to him about my quest to find an answer (among other things; like why I didn't join him for the Bike trip he organized right before OOW #BikeB4OOW). Bryn suggested to contact Kevin Jernigan, who is a Senior Director Product Management for a number of products including Temporal Validity. So, after getting back from Oracle Open World I contacted Kevin and he was very helpful. Turns out there is no supporting syntax to define multiple Validity Periods for a single statement with the CREATE TABLE syntax. You can specify at most one valid time dimension when you create a table. You can subsequently add additional valid time dimensions to a table with the add_period_clause of ALTER TABLE. The limitation is with the CREATE TABLE syntax, not with the Temporal Validity implementation. One final thing I asked Kevin: How about that DBMS_METADATA behaviour that I encountered in my blog? Re: the problem with DBMS_METADA, I will check with development to see if this is a known issue (and maybe already fixed in a test environment? ), and if not, we will file a bug to have it fixed. Good to know that this issue is (going to be) addressed and that I found my answer about Temporal Validity. What happens when you use DBMS_REDACT with a complete row update? First to create a test table (of course called EMP) in schema "A". Next to place a DBMS_REDACT policy on it which replaces the credit_card information with X for each digit. Now for the row update without actually changing any data. The code above will update the information for SMITH without altering the data. And there you have it.. looks like we lost some information along the way. Both jQuery and Font Awesome are standard included with APEX5 (still in early adopter). With a little bit of jQuery you can create an animated button that reflects that it is doing something in the background. For this example I created a button "Text + Icon button". Simply drag and drop this in the Page Designer. The Icon CSS Class: "fa-play-circle-o"
and the action: "Defined by Dynamic Action"
See an example here: Early Adopter APEX; login with "demo" and password "demo". 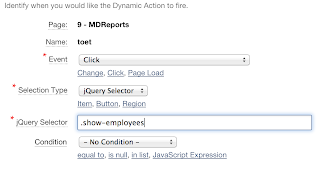 Almost two years ago, I wrote a little blog on how to trigger a Dynamic Action from a report. You can find that blog right here. Things have changed with APEX5 (which is currently still in "early adopter 2") which allow you to do this in a more clean way (or at least I think so). No need to create a "fake link" so the user know that the icon is clickable. No need to upload your own images, use the already shipped Font Awesome library. Instead of "ok" and "nok" for the "IND_COMPLETE" column, I am using "up" and "down". These names will be used to get the correct Font Awesome icon. If you want to use different icons, check the Font Awesome Cheatsheet, version 4.0.3 (the version currently used by the early adopter. Instead of having to create a Link Column, linking to a dummy page like Page 0, the IND_COMPLETE column can stay a "Plain Text" column. The class added to the IND_COMPLETE column will contain the reference to the Font Awesome icons you want to show. The class "setComplete" is there to have the Dynamic Action fire when the column is clicked. The id reference is there, so the Dynamic Action will know which ID to update in the table. Finally styling the cursor so the user will know that the icon is clickable. As far as the last point goes, there was a comment in the original blog which suggests using the "Submit Page" action because the pagination will return to the first set. I found a plugin to do a refresh which remembers the pagination, unfortunately it doesn't play well with APEX5. I put a small demo on the Early Adoptor site. During a trial run for my presentation at Oracle Open World "Oracle 12c for Developers", you can find the slides on slideshare. there was a question regarding "Temporal Validity". Temporal Validity Support lets you associate one or more valid time dimensions with a table and have data be visible depending on its time-based validity, as determined by the start and end dates or time stamps of the period for which a given record is considered valid. The question was: "Is it possible to have multiple temporal valid periods for a table?" According to the documentation definition above it should be possible to create multiple temporal valid periods. Let's try this. That worked. There are now two valid period defined on table T. Maybe I got the syntax wrong, let's take a look at the Metadata and find out where I went wrong. Oh oh.. I think I found a little bug here. I wonder what will happen if we add data and run some queries. So yes, you can add multiple temporal validity periods to a table but only with an alter table statement. A common requirement is to show a Master-Detail Report where both the Master as well as the Detail Report show multiple records. When you click on one of the Master records, the connected detail records are shown as well. This is very easy to accomplish with a Hidden item and a Dynamic Action. The detail report will consists of the employees which belong to the DEPT record which is clicked by the user. 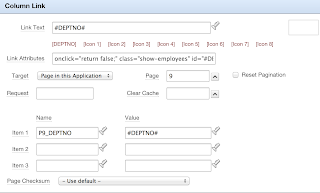 You will notice that there is a reference to P9_DEPTNO in the query, that will be the hidden item. So there are two reports and a hidden item on the page. The user will need to click on something, so the DEPTNO column from the first report will act as a link. 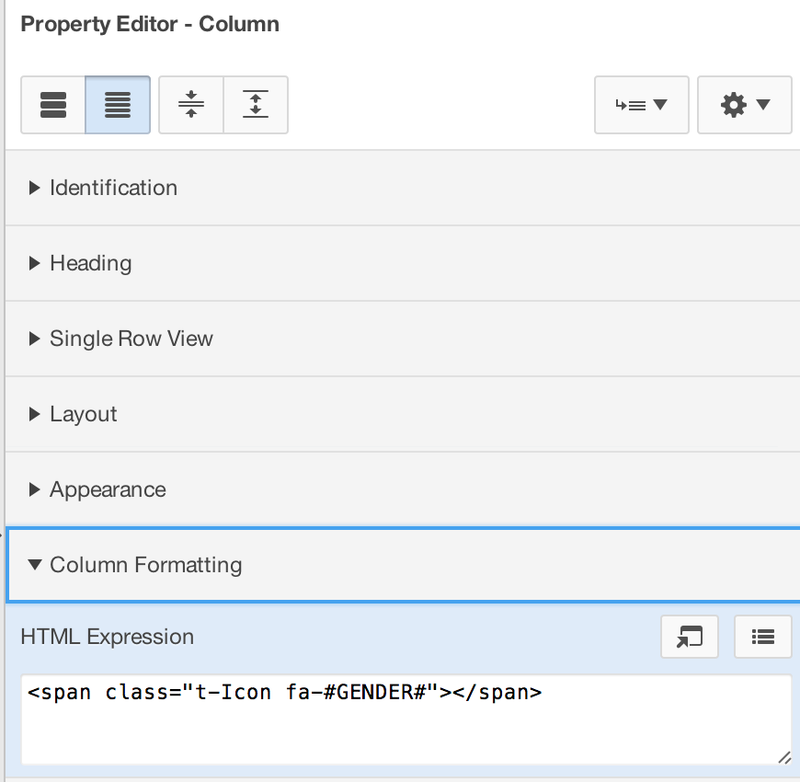 Navigate to the column and fill in the section labelled "Column Link". Now all components are in place, time to create the Dynamic Action. The second part of the Dynamic Action is to refresh the Employees report. 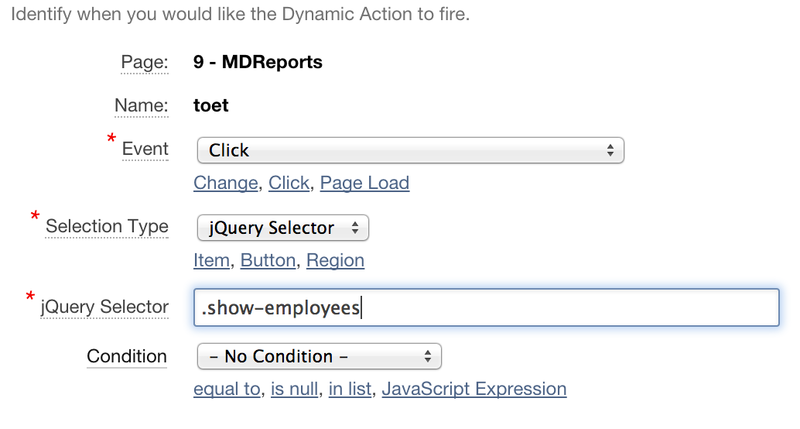 Add a TRUE action to the Dynamic Action where you specify "Refresh Region" and choose the details report (Employees). You can find the demo right here. 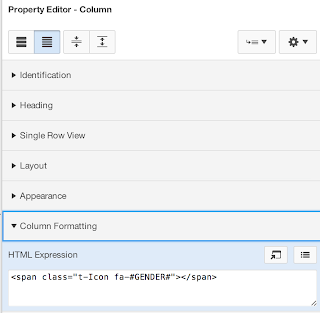 APEX 5 is currently in Early Adaptor 2, so the exact implementation of this blogpost might change when APEX 5 goes GA.
Font Awesome is standard included with APEX 5 and you can use the icons on buttons, there is a special property for that. I was playing around the other day and I wanted to include some Font Awesome icons in my report. Because the EMP table doesn't have a gender column, I decided to create one using a CASE statement. Some are "male" and some are "female". 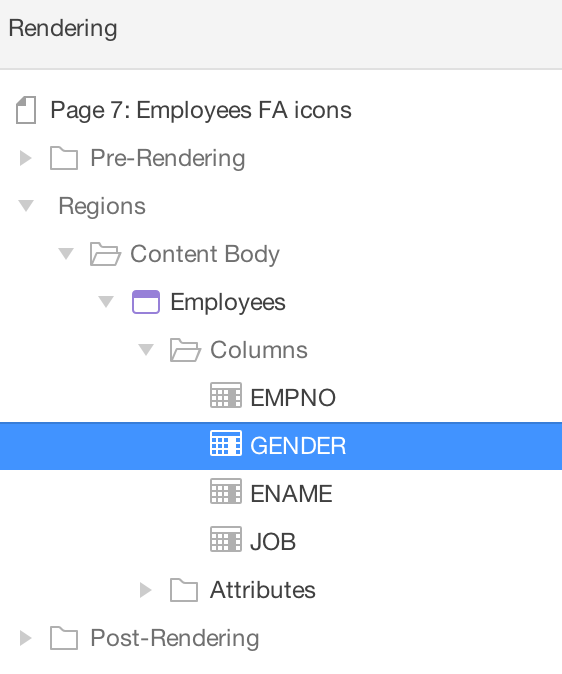 Navigate to the GENDER column. 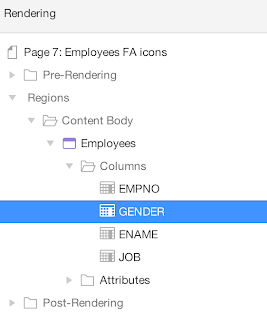 With the GENDER column highlighted, move your attention to the right side of the Page Designer and focus on the Properties panel. The report will look like the screenshot below. As you can see there are icons for the males and the females in the EMP table. 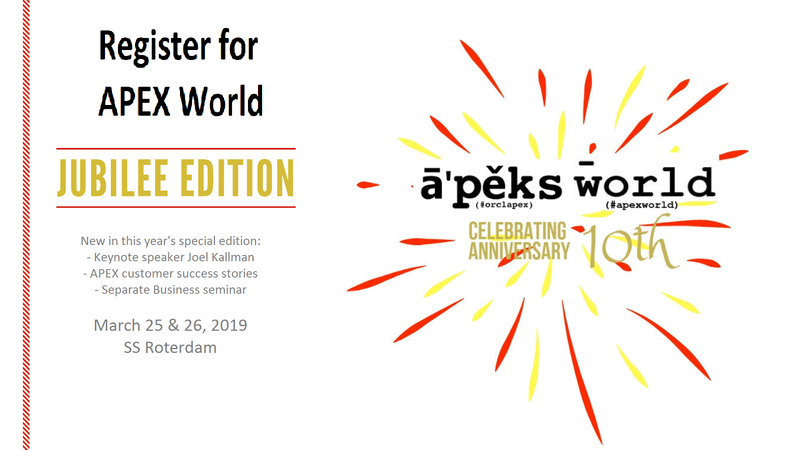 Last week, at the yearly ODTUG Kscope Conference, I did my presentation "Getting Started with APEX Plugin Development". After the session Patrick Wolf, Principal Member of Technical Staff for APEX, pointed out an improvement that could be made. In the presentation I point out the need to escape the input that you get from a user of the plugin in order to protect the plugin from unwanted use, like SQL Injection, Cross Site Scripting and the like. In the example plugin that is created in the presentation, I use HTP.ESCAPE_SC to escape the special characters (hence the name _SC). There is a newer and better method to escape the special characters. By default the extended level of escaping is enabled, but this can be overridden (for whatever reason). To illustrate both the extended and the basic level of escaping, the examples below set the level explicitly. With the extended level of escaping, the forward slash and the single quote are escaped as well. When you set the escaping level to Basic (example below), you will get the same results as if you were using HTF.ESCAPE_SC. Being a huge fan of Logger, the PL/SQL logging utility, I really wanted this be to included in the project that I'm currently working on. So I downloaded it (link at the bottom of this blog) and included it in our deployment scripts. Done.... at least I thought so, but of course this wasn't the case. The first lines make sure that the user is not prompted for input and to see output from DBMS_OUTPUT. The "Create table" is done using dynamic SQL after which some more action is taken. To determine which action needs to be taken is handled in the PL/SQL block - now simply replace by some DBMS_OUTPUT. In this PL/SQL block the datadictionary view USER_TAB_COLUMNS is queried. This install script is usually run in the schema where the objects need to be installed. I would have expected that changing the CURRENT_SCHEMA would also query the USER_TAB_COLUMNS related to the schema that we changed into. This is not the case. 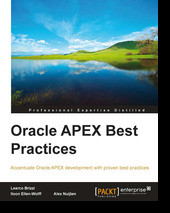 A few weeks ago Packt Publishing asked me if I would give a book review for the recently released Oracle APEX Cookbook, the second edition by Marcel van der Plas and Michel van Zoest. In exchange I would get the e-book for free, so this can be considered a sponsored blogpost. Even though it is sponsored I will give my honest opinion about it. The book contains fifteen chapters starting with "Creating a Basic APEX Application" covering several topics such as "Themes and Templates", "APEX Plug-ins", "Using Web Services", '"HTML5 and CSS3" and ending with "Mobile". Each of the chapters contain several recipe on how to implement a particular feature or functionality. The way each recipe is setup is as follows: it starts with a short introduction "Getting ready", followed by "How to do it..." and lastly "How it works...". Most recipes also include "There's more..." which gives you additional information about the topic at hand. Because the book is written in this modular method, it is easy to pick and choose the order in which you want to go through the book. You feel that you know how to "create a basic APEX application" but haven't created your own plug-in, then skip to the chapter on "APEX Plug-ins". It is not necessary to read the book in the order of the chapters, which I tend to do. Usually I read books before I go to sleep, and yes most of the time the are technical books. This book was no exception. Even though I work with APEX every day, sometimes it was hard to follow along with the different recipes. In my opinion this is not a shortcoming of the book, but the way I tend to read books. This book would be more suited to be used following the recipes while working in APEX. The recipes in the book follow a similar pattern as the official Oracle documentation. Each recipe starts with a section called "How to do it..." and provide a list of "do this", e.g. "1. Click on the Create Page button" or "6. Click on Create". This works out fine as long as the wizards don't change (which could happen with new releases of APEX). For the beginner this could be confusing if they work with a slightly different version of APEX. For the more experienced APEX developer this should be no problem, they would know the intended behaviour. Where this book is ahead of the way the official Oracle documentation is set up, is the explanation after the part "How to do it..." called "How it works...". In this section the concepts are explained of what you just created (if you follow along which I obviously didn't). At first when I started reading the book, I tend to start with the first chapter and work my way through to the end, I was under the impression that the intended audience was the beginning APEX developer. But as the book progressed, I ran into topics which I hardly ever (or never at all) have touched and picked up some good hints and tips. I'm sure that I will get the text handy when I need to, for instance, translate an application or work with websheets. The question then arises: if I haven't used these features before - would I need them in the future? All in all, I like the book and would surely recommend it - for all APEX developers and especially for beginning APEX developers. Thanks Packt for providing me a copy of the book and allowing me to review it. 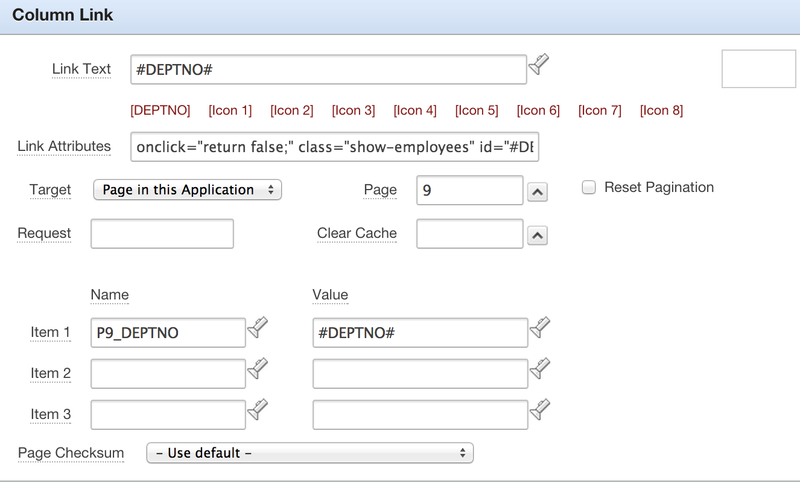 On one of the pages there was a need to refresh a report region when a node in an APEX Tree was clicked. As far as I know there is no built-in method to create a Dynamic Action to a node in an APEX Tree, so this might call for a Custom Event. The "value_from_table" will be available in the Custom Event as the Data object. In my case I needed the "value_from_table" and use "Set Value" as a TRUE action, and refresh a report.